BCA Beauty: Sonia Kashuk for Target Breast Cancer Collection | Fashion. Style. Beauty. | Life is short. Live well. Sonia Kashuk in her Financial District studio. 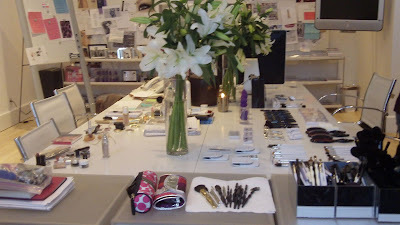 Recently, I was invited to the Financial District studio to learn a little more about the beauty brand and the iconic makeup artist Sonia Kashuk and her line for Target. I have to say that meeting the legendary makeup artist in person gives you a whole new respect for the line and the intense quality standards that go into what you purchase. Sonia’s workstation in her studio. Celebrating the 10th year behind her partnership with Target, Sonia admitted that she continues to do the makeup line out of respect for the customer, to give each and every one of you the opportunity to purchase high quality cosmetics and tools at a fraction of the cost because she every product she creates is for the distributor directly. If you’ve not used her products yet, I assure you one shot and you’ll be hooked: this is comparable to many department store labels at a mere fraction of the cost. Don’t even get me started on the makeup brushes, people – her makeup tools are some of my favorites in the world and the fact that they’re available at such an accessible price is just icing on the cake. Curl For A Cause Eyelash Curler ($9.99) – Because every woman needs a good one and you need to learn how to use it if you don’t know already. Instant eye opener. The handle is metallic pink. Adorable. Sweep Of Pink Brush ($12.99) – A great pressed or loose powder brush of amazing quality. Great for a flawless face. The handle is, you guessed it, pink. I love it. 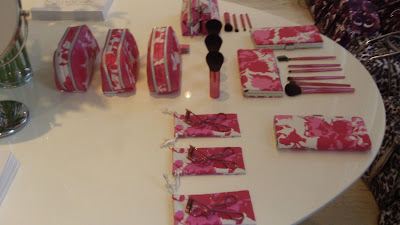 Brush Up On Pink Purse Brush Set ($12.99) – I use this on the subway almost every day applying my makeup so I can attest that these small purse brushes are fabulous, easy to handle and really get the job done. It contains a blush brush, a small eyeshadow brush, a blending brush and a concealer brush all in a cute floral case. Plus, as you can figure, the handles are all pink. How much better does it get? Not much better, really. Brushed To Perfection Travel Brush Set ($19.99) – Perfect for those of us who travel on a regular basis, this travel set contains a powder/blush brush, a small eyeshadow brush, blending brush, an angled eyeshadow brush, smudge brush (perfect for day to night smoky eyes, ladies), and a lash and brow groomer. You can guess what color the handles are and yes, I love everything about it, down to the gorgeous slender carrying case which is, yep, pink. Bag Lady Cosmetics Bag ($11.99) This gorgeous modern floral print and patent trim has made its way into my own bathroom. I love this bag and it helps keep me organized so I’m not crazed trying to find my makeup. Me with one of my makeup legends and all-time favorite people, Sonia Kashuk. 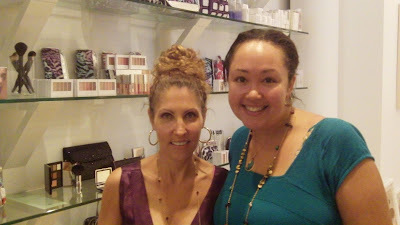 It was such a pleasure to meet Sonia and learn about her amazing products. From skincare to cosmetics, this makeup legend’s products are as thoughtful as their creator. Need some new beauty tools? Head to Target and pick up some of the best from Sonia Kashuk at a price that will make you smile and for a cause that will make your heart sing.